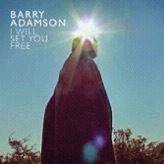 To support the release of I Will Set You Free, Barry Adamson played a show at London’s Queen Elizabeth Hall on 9 February 2012. Adamson and his band – Ian Ross on drums, Nick Plytas on keys, Bobby Williams on guitar and Maxwell Sterling on bass, with the Trinity Strings and Steve Hamilton’s horn quartet – tore through tracks mostly taken from I Will Set You Free and its predecessor, Back To The Cat. Support came from The Gilded Palace Of Sin and comedian Simon Day reading poems as Geoffrey Allerton. I reviewed the concert for Clash‘s website with photos by Andy Sturmey. The full review can be reached by clicking here. Thanks to Stuart Kirkham for confirmation of the setlist. Note: this was my first piece written for Clash. Up to that point, everything I had ever written had been for Documentary Evidence or its predecessor blogs.